My name is Jennifer. I went last night to see Miss Saigon for the second time at the WST. I first saw it on Broadway. When I heard Eric's voice last night, I was mesmerized! He and the entire cast at the WST did a wonderful job! The emotion and sincerity on how they portrayed their roles was amazing! Also, Eric is very easy on the eyes! :) In short, please pass along to Eric and the entire cast of the WST that I really enjoyed the show. As someone who does not have any musical talent what so ever-I truly enjoy watching good theatre. Thank you! Eric- I have become a fan! I was excited to order the CD. Can't wait to get it...What is interesting to me is that Eric's performance really moved me. I have seen a lot of shows. This was the first time that I felt mesmerized, emotionally engaged. It was weird that in a matter of few days I went from "it'd be interesting to see the same chris" to "I need to hear him sing". This is the first time I have contacted any fan club of any sort. I guess I am a fan. We went to see the show in Philly and loved the entire cast. Eric's voice is the best I have heard in the role of Chris, and we've seen the show several times. I am anxious to listen to the CD. 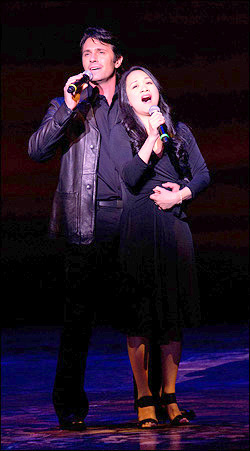 Don't miss Eric and Melinda in "Miss Saigon" at the Walnut Street Theater in Philadelphia. Many are saying this is the best production they have seen, including Broadway. Due to the overwhelming demand, the show has been held over and will run until July 24th. I am a specialist in voice care (Vocologist), and a Professor in Speech Pathology. During this week I am visiting Philadelphia as I am attending the 40th Annual Symposium of The Voice Foundation. Today I saw the Miss Saigon show at Walnut Street Theatre. I was seriously impressed with Eric Kunze's voice. Beautiful! He has a new fan. I found your fansite for Eric as I was checking out the info for Miss Saigon at the WST [Walnut Street Theater]. What a great way to let people know about the talented Mr. Kunze! Miss Saigon is my favorite Broadway show and I have seen it at least ten times in many different states. I was lucky enough to see Lea Solanga in it when she returned to Broadway but unlucky in Dublin, Ireland when the show was canceled due to mechanical troubles, if you can believe that! As every theater lover knows, each time the curtain goes up it's a different show and atmosphere each time. When I saw it on May 25th, I was totally blown away by the entire production! It was the most emotional and excellent production I have ever seen!!! Whenever I see Miss Saigon, I always fall in love with Chris during the first act but really change my mind when he pretty much kicks Kim to the curb in the bedroom scene with John and Ellen. It always bothers me that he decides to leave Kim and Tam to fend for themselves. Each performer I've seen portray Chris has always been good but not memorable in any emotional way. Eric's acting talents really came across and I finally believed that it was heartwrenching and horrible for him to decide what to do. I still loved him by the time the curtain came down! The entire cast was so believable that I felt like I was watching it for the first time. It broke my heart and I quickly tried to get rid of the tears when the lights came on so people didn't think I was a basket case! I purchased Eric's CD before I saw the show and his voice was phenomenal in person. While I sat in the audience at intermission, I thought about the difficult role Eric has playing Chris and wondered if he ever looks out at the audience and imagines if any of the men sitting there has left a child behind in Vietnam. It makes me sad to think that and I can't even watch the film they show when John sings Bui-Doi. Thanks for the great website about Eric and I look forward to following his career and seeing him on stage again. Will you be doing any more special fan club events before the show ends in July? How do I join the fanclub? I replied to Susie that the next fanclub dinner will be held Friday, July 15th at 5:00 p.m. at Marathon Grill, just 1-1/2 blocks from the theater. All are welcome to attend, just email me at maggiwun@yahoo.com to rsvp. Anyone wishing to be on our mailing list to be notified of Eric news should email me as well. Thanks Susie! I'm sure Eric and the cast will be blessed to read your kind remarks. Just a heads up for our MISS SAIGON fans: Due to popularity, we're extending MISS SAIGON until July 24...The Heat is On - LONGER! Tickets for the extension are on sale this Monday. As one would expect in a musical production of this caliber, all the voices in the cast are excellent; but it is the quality of the acting that sets the WST production apart from others. 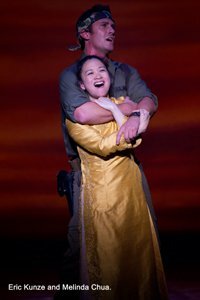 The chemistry between the American GI, Chris (Eric Kunze) and the young Vietnamese girl, Kim (Melinda Chua) is palpable in the duet, “Sun and Moon”, aided in part by the tender staging, deftly handled by veteran director, Bruce Lumpkin. This team has worked together before, so perhaps that accounts for the level of intimacy achieved in the lovers’ early scenes. Whatever the reason, the result is beautiful to behold. Chua makes a fine Kim, fragile and sweet of voice, but with the core of strength the role demands. Kunze’s vocals are masterful and his portrayal of Chris completely truthful. From Marius to Miss Saigon, a Broadway Star Makes His Walnut Debut! "When you have a man like Eric Kunze playing Chris in MISS SAIGON, it's easy to understand how Kim can carry a torch for him after so many years. There's no denying that he's a handsome fella, but furthermore, he's an enormously talented performer with the kind of leading-man good looks you'd expect for the role. And boy, does he deliver the goods! Originally from San Diego (which he still calls home today), his first theatrical performance was at the age of 17 in a production of Tom Sawyer at the Moonlight Ampitheater. He spent many summers on that stage growing as a young performer before going to college after high school. "I love coming home to family, friends, weather and ocean air that San Diego provides" gushed Eric. In the last quarter of his college year, he was in New York City on an internship studying theatre, and auditioned for Les Miserables, landing the role of Marius. It was time for Eric to make his Broadway debut in the world's most popular musical. Who could ask for anything more? There was no where to go but up from that point on. "About nine months later," Eric explained "I was moved into the role of Chris in MISS SAIGON, also performing in the First National Company (where I met and worked with Melinda Chua and Phillip Michael Baskerville from our current production) as well as the Broadway company." Working with the big stars and big lights on Broadway could make an actor jaded, but not so in the case of Eric. He couldn't be more thrilled to be here in Philadelphia at America's oldest theatre reprising his MISS SAIGON role. "This production at The Walnut is by far one of the most passionate, well sung, and beautifully directed productions I have ever been a part of - thanks to Bruce Lumpkin. This story and music that Philly audiences are experiencing is absolutely TOP NOTCH and I am fortunate to be part of something that affects hundreds of people every night." As for what part of the show is his favorite, all he can say is "it is difficult to point out a particular moment that is my favorite, but I suppose every time I get to sing into my co-star's eyes, that is a pretty special moment to me." And when you hear Eric singing such anthems as "Why, God, Why," it will be a special moment for you too. We can't wait to see what's next for him after his Walnut debut in MISS SAIGON!" THIS IS THE HOUR OF MISS SAIGON! Such an amazing production! I am honored to have seen it! And the cast was out of this world! - David McCloughan Jr. These are quotes from actual audience members who have experienced the sensation at the Walnut Street Theatre that is MISS SAIGON! The standing ovations keep on coming. The applause is louder than the helicopter. The critics agree that MISS SAIGON is really going to heat up Philadelphia this summer. MISS SAIGON is a blockbuster that audiences can't stop raving about. With Bruce Lumpkin's brilliantly nuanced direction, Michelle Gaudette's heart-stopping choreography and the star-making performances of Melinda Chua and Eric Kunze, MISS SAIGON is a masterpiece that will dazzle your senses.